*First published via email on Friday, February 22, 2019. Click here to subscribe. After an incredible RTT session last night with a client, he summed it up so well: "RTT is about changing your perspective, your perceptions, and your stories so you can move on and become the person you most want to be." I'm currently going through the stages of grief with what might be the dissolution of a very significant relationship in my life. I was in denial and anger from October to December and bargaining for a bit in January and then quickly slipped into depression after that. I'm teetering between depression and acceptance now, and I'm being gentle with myself about it. There are still questions constantly running in my mind at all hours of the day, "Did I make a huge mistake? How is she? Does she hate me? Are we ever going to salvage this? Does she want to? Or is she done with me? Am I a horrible person? Am I one of those sad people who can never keep a real friendship?" During this time, I'm doing what I can to RTT myself. To change my perceptions about this whole experience because I want to be able to look back on our friendship, which I cherish so much, and feel love instead of loss. I'm sad about the way things went down. I'm sure when I look back some day, I will be able to see how I could have handled things better and feel love and acceptance towards myself and her instead of anger, shame, and disappointment. At this point in time, I'm very clear that we are both incapable of being the friends that we each need. She's going through multiple massive life changes and so am I. We both have been needing a lot of support that we don't have the energy or time or space to give, which created a lot of disappointment and resentment. So the perspective shift that helped me move through anger is that while I'm sad that we haven't been able to support each other during these times, I know it will clear up a lot of space for each of us to accept the support we need from other people who fit the bill better. By taking care of myself and setting my boundaries, I have to trust that I am doing what's best for everyone involved. Even when it doesn't look that way on the outside. 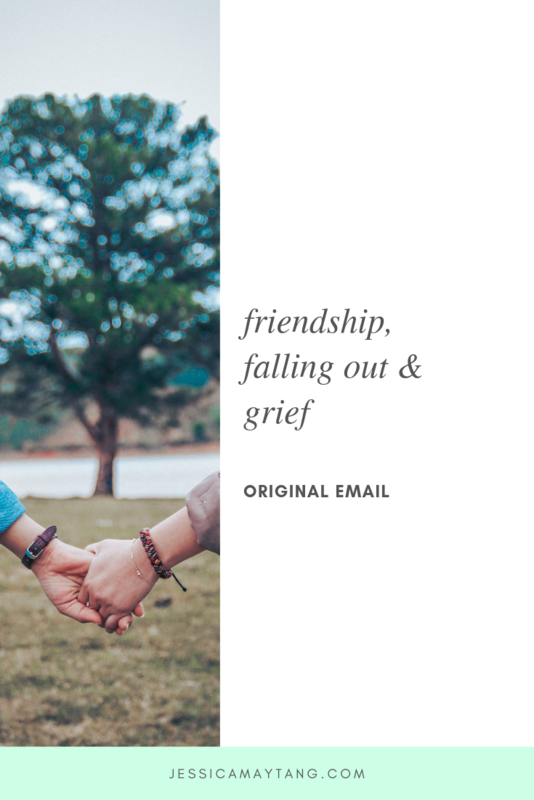 Have you gone through a falling out in a significant friendship? How did you get through it?